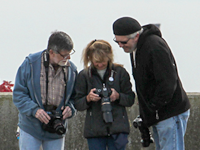 The Whaling City Camera Club is a group of people of all ages and photographic abilities who share a common interest and passion for the art of photography. We believe the best method of understanding the art of photography is through education and the sharing of ideas and mentoring between members. To increase our creative skills, knowledge, and technical abilities in the art of photography, the Whaling City Camera Club supports its members in sharing their individual knowledge and experience with others in a supportive friendly environment. Member contribution is encouraged. Our yearly program consist of friendly monthly competitions, workshops, field trips and other special events. A key feature of this year's program is to have special workshops hosted by fellow members with advanced knowledge in a particular area of photography and/or a specific photography editing software. Throughout the club's season we also sponsor fee based workshops by professional photographers offering their expertise in the art. 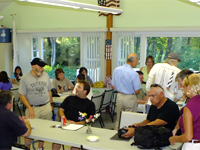 Visitors are always welcomed at our twice monthly meetings. Find out what we are all about and decide if you would like to become a member of this enthusiastic group. It is the goal of our club to serve our members by encouraging improvement of their photographic skills through educational programs featuring guest lecturers, friendly competitions, individualized mentoring and most importantly, fostering friendships with others who share a love for photography. Whether digital or film, a photographic image is an expression of the photographer's vision relaying an emotion of a moment in time. We hope to expand our vision in the art of photography. If you have an interest in photography whether beginner, intermediate or advanced, we would be pleased to have you become a member of our camera club.